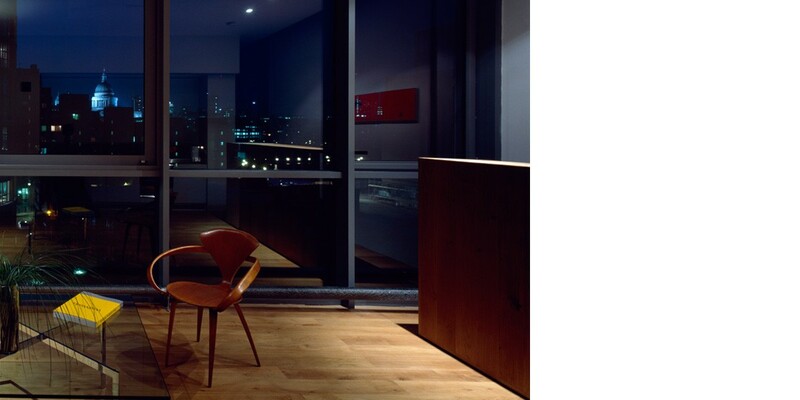 A small loft apartment located opposite Tate Modern and overlooking the City of London across the river. A central core containing cooking, storage and shower separates the living and sleeping zone. Particular functions are activated by transforming devices: the living area alters to provide cooking activity by raising an aluminium blind and pivoting a half-wall to become a table; the bath and bed are set into a raised stone floor and visually connected at will by a glass panel changing from translucent to transparent. A small window in the shower frames a view of St Paul\’s Cathedral one-mile beyond.